I was first introduced to Adam Crack when he was on Conan O’Brien. I had seen the video shouted out on facebook and watched it immediately. 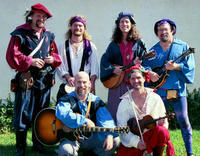 Now I have added Adam Crack to the bucket list of Ren Faire entertainers that I want to see. In real life, Adam Crack is Adam Winrich. This young man has spent his life mastering the whip. When you are lucky enough to catch him live you are in for a treat. The stunts he does with various whips promise to amaze you and make you wonder just how you would learn to do that yourself. He has become and expert and his expertise is defined by the sheer number of World Records that he holds. Adam Crack (as he is known on the Renaissance Festival circuit performs all manner of tricks ansd stunts with a whip. Some of the things you will see hi do include: single-handed whip cracking, double-handed multi-crack demos, balloon popping, candle snuffing, paper cutting, flower snipping, whip dancing, wraps & fire whips. Did you catch the last one? FIRE WHIPS! You know me, my little Rennies, I love anything that has to do with fire. If you set something on fire it is always better. 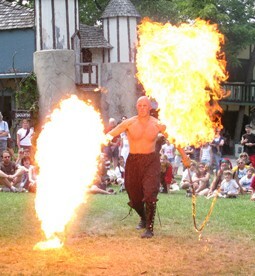 2-handed fire whip cracking = Freaking Awesome! Put Adam Crack on your list. His show is a must see. Comedy, history, education and fire. What else do you need. He is talented and works a crowd like nobody’s business. And if you are looking for a show to get involved in… there is always room for audience participation. Want to see a show full of skill, danger and awe-inspiring skill, Adam is your man. You can see Adam at Ren Faire’s (Bristol Renaissance Faire), Wild West Festivals (Spirit of the West) and other shows around the country. If you are looking for someone to entertain at your next event? Remember the name Adam Winrich.